Some lizards in the eastern U.S. have adapted to invasive fire ants—which can bite, sting, and kill lizards—reversing geographical trends in behavioral and physical traits used to avoid predators. A new study describing this reversal appears online on November 29, 2018, in the journal Global Change Biology and reveals that new environmental challenges can override the historical influences that originally determined geographical trends in traits. "Rapid environmental change, be it from changing climate or the introduction of invasive species, is putting a lot of pressure on native species," said Christopher Thawley, graduate student at Penn State at the time of the study and first author of the paper. "Usually when researchers look at how native species might respond to these kinds of threats, they might measure one characteristic of the animal and at one or a few sites. In this study, we looked at three separate characteristics of eastern fence lizards from thirteen sites spanning a thousand miles and found that these lizards are capable of adapting in a concerted way to meet the threat of invasive fire ants, and in a relatively short time frame." Some behavioral and physical characteristics within a species change gradually across geographical space, for example animals at one end of the range may have relatively short limbs that, as you move across the range, are longer. These geographical "clines" may be related to changes in temperature, precipitation, or other environmental factors that also change across the geographical range, often with latitude. 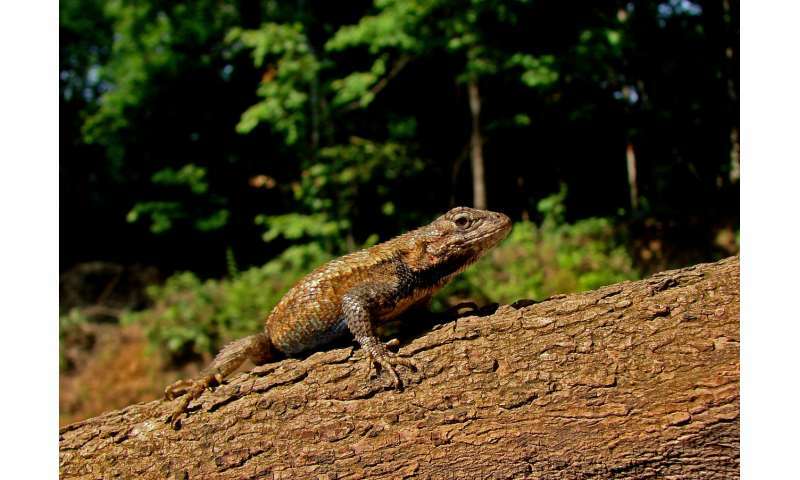 "We found that fence lizards follow predicted latitudinal clines in anti-predator behavior where fire ants have not yet invaded—from about New Jersey to northern Tennessee," said Tracy Langkilde, professor and head of biology at Penn State and senior author of the paper. "They rely on camouflage more often at lower latitudes in the absence of fire ants." To avoid detection by predators, lizards at lower latitudes typically sit still and use their mottled coloring to blend in with their surroundings. This is an effective strategy against most of their natural predators, like birds, which hunt visually. "But where fire ants are present, from central Tennessee south to coastal Alabama, that pattern reverses," said Langkilde. "Sitting still and blending into the environment is very ineffective against fire ants, which quickly swarm and sting the lizards, paralyzing and killing them. Instead, as you move southward towards the point of first invasion of fire ants, where these invaders have been around for longest, these lizards are more likely to respond as most people would when attacked by fire ants; they twitch their bodies and use their hind legs to remove fire ants and/or flee from the attacking fire ants. This strategy helps them to survive these fire ant encounters." The researchers also observed a similar reversal in patterns of hind-limb length. Museum specimens of lizards collected prior to fire ant invasion—and present-day lizards at sites without fire ants—show a pattern where lizards at the southern-most sites have the shortest hind limbs. But at present day sites with fire ants, lizards at the southern-most sites have the longest hind limbs, showing a significant reversal from historical patterns. Patterns of stress physiology also shift with the presence of fire ants, with lizards at the southern-most sites with fire ants producing more of the stress-related hormone corticosterone when threatened. "The documented changes to limb length and stress physiology actually help lizards deal with fire ants," said Thawley. "Longer limbs allow for greater sprint speeds and more effective fire ant removal, and elevated corticosterone levels prime animals to perform behaviors like twitching and fleeing. So we're seeing very complex changes in these animals over a very broad geographical range. This suggests that environmental changes like invasive species can push species off their traditional trajectory for a variety of traits." While these changes might benefit lizards in the short term by allowing them to survive attack from fire ants, the costs of these changes, which seem to go against historical adaptations, are unknown. "These clines exist for a reason, so to see a complete reversal in these patterns raises a lot of questions," said Thawley. "For example, some of my previous research suggests that twitching and fleeing more frequently might make lizards more vulnerable to visual predators." The changes observed in this study are also notable because they happened over just 80 years—about 40 lizard generations—or maybe even less. "We usually think of evolution happening over hundreds, thousands, or even millions of years so seeing that fence lizards can adapt to a threat like fire ants in such a complex way over a short time scale is interesting," said Langkilde. "There is still a lot to learn about the broader mechanisms and consequences of adaptation to fire ants and other environmental challenges. Understanding how some species can adapt so rapidly, and the costs of doing so, will help us predict and manage our changing environment."